Let’s Interview; SuperVektoroids Developer PixelStrike Games! As you’ve probably noticed, we’ve been interviewing a fair few people here on Gaming Reinvented recently. We’ve interviewed Power Level Studios about Soul Reaper on the 10th of August. We’ve talked to ARTAKE Games about their Zelda Twilight Princess reimagining on the 17th. And well, with Ole Ivar Rudi of Rain Games discussing Teslagrad just a day ago, that makes it three interviews in August already! That’s got to be a new site record! So, if you’re interested in finding out more about them and their work… keep reading! Well, you know the drill now. Who are you? What’s the background for the people working at PixelStrike Games? PixelStrike Games is Damien Labonte (me), the game designer and art/audio guy, and Sina Masoud-Ansari, also the game designer and coder. We are from Vancouver BC, Canada and Auckland, New Zealand (in that order). It’s just the two of us so we have many hats to wear. And for that matter, how did you get started with video games? Neither of us have done anything really like true video games. I have some experience with a virtual world for children app, and Sina is a research programmer at the University of Auckland. This is our first serious foray into a true video game. Any favourites you have from your childhood? Sina: I was about 4 years old when my dad got an IBM 386, so I’ve been a PC gamer my whole life and grew up on Doom, XCOM, Civilization and Ultima games. XCOM is probably my favourite and every few years I get nostalgic about it and start up a new campaign. Onto game dev next. What inspired you to start up a video game development company? Damien: I was a big 3D gaming aficionado, as buggy as it was to get working. When the Rift Kickstarter happened, I knew that I wanted to make a VR game. It was destiny! We met on Reddit when I asked if anyone wanted to team up and make a VR game. And Sina answered the call. And we have been working on this game ever since. Sina: For me it was definitely the magic of VR. I was at an NVIDIA conference some years ago when they had demos of the Oculus Rift. This was before the DK2 was available for purchase and I remember feeling like I was in a dream. I raved about it to everyone and started spending time on the Oculus subreddit where I met Damien. How about the name? Where did Pixel Strike Games come from? Sina and I futzed around with names for a while. Our original name was going to be Z-Bucket. As in, pass me “ze’ bucket” because of VR motion sickness. Well that was clearly not a great name. Then I saw a video on YouTube showing how Lichtenberg Sculptures are made in glass with electricity, and PixelStrike Games was born. Did you have any previous game development experience before starting up the company? Damien: Yes, I was the creative director of a company called Cackleberries, an online game world for young children, basically simple apps for education. I work in Animation now, as a background supervisor. Sina: None! I remember watching the Indie Game movie and coming away from that with a desire to make something. But never followed through with the idea until I started getting into VR. Super Vektoroids is an arcade shooter played in VR. So why did you choose that genre? Did you have a lot of memories of the original Asteroids game? Damien: Space Duel more so, which is really just a clone of the original asteroids with different art. It had an impact on me when I first saw it. I certainly loved visiting the arcade, I suppose one had to use their imagination more back then, maybe that’s what made the games special. Sina: I did for sure, I have fuzzy memories but I remember playing a lot of Asteroids (or some imitation of it) on PC as a kid. Making Super Vektoroids is kind of my way of showing appreciation for those simple games. VR just adds a lot to the experience, it’s like 3D on steroids. Seemed like a no-brainer to us. And how did the name come about for this game? Vektor is pretty obvious, but Vektoroids? What’s the story behind that? Well it’s a vector art styled game. Where you shoot asteroids. And enemies. And your super of course! Plus, VektorRoids 🙂 I know, we are super clever. It seems the game was an entry in a ‘VR Killer Apps’ contest, and did pretty well too (ranking as a finalist overall). Did you expect that? The trailer showcases some of the different ships, including one with dual lasers, a few that seem to go at super speed and an extremely small ship among others. Can you give a bit more detail about their specific differences and abilities? Each ship has a slightly different control feel, plus a different weapon. We wanted the players to try and feel out which ship they liked best. The ships differ in turning rate, speed, weapon reload speed, and how fast they come to a stop. The VFO is very instant stop and start, and can maneuver very well, (if a bit unwieldy) where the Looney Lander is very low drag, so it keeps on floating, which is great for backwards shooting. We are going to be adding another layer of difference in the amount of shields each ship has, so each will have more obvious pros and cons. The ships aren’t balanced yet, thus early access so we can tune the game more to its core audience. How about some of the enemies? The trailer shows a few, but can you describe a few more of the enemies, their designs and AI patterns in a bit more detail? There are quite a few enemies, starting with small and quite dumb seeking enemies, enemies that can avoid your shots, spirally and zigzagging enemies, some that split into smaller enemies, some that shoot lasers, bullets, heat seeking missiles, enemies that dart at you when you get too close, to the more difficult shielded enemies that take a lot of shots to break their defenses. 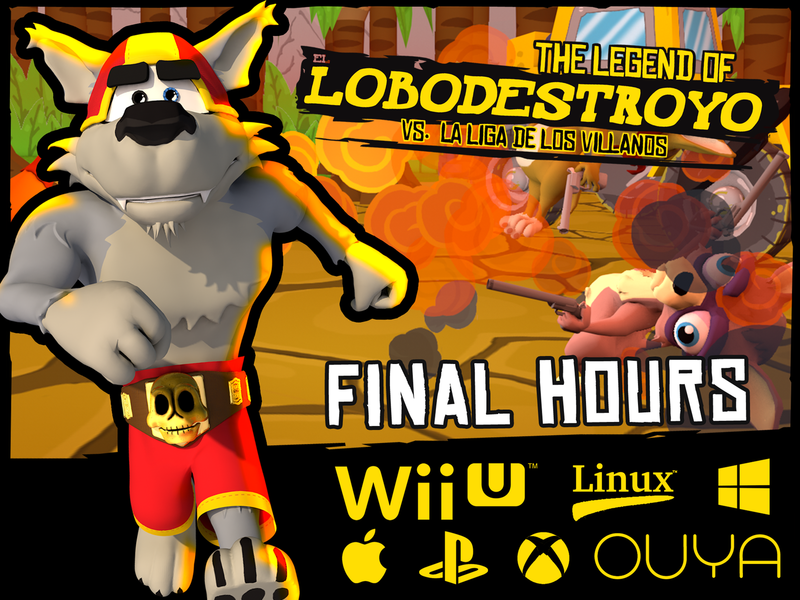 If early access does well, we would like to add in mini-bosses as well as a final boss. Fingers crossed on that! Again, if early access does well, we would like to add a simple narrative (we have it all planned) that would take the player through a storyline and various areas to defeat bosses and new enemies per zone. I’m really hoping we can get that chance. But for now, it’s a score chaser, but a fun one at that. There are lots of enemies to keep you challenged. 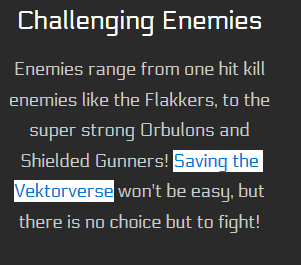 There’s also a few references to a ‘Vektorverse’ on your site. Is this something you plan to build on going forward, like a fleshed-out universe where games based on this one is set? Or is it just a quick joke? We want the Vektorverse to be its own world, within a world. It’s no joke that you are the Only One who can Save the Vektorverse from the Glytch Armada. Graphically, it’s a very unique title, with a bright and trippy looking vector art style. Obviously, that’s partly inspired by the original Asteroids game, but what other influences were there here? I had a Vextrex and it was a magical device to me. It was extremely unique at the time, and vector style still carries a lot of appeal I think. You don’t see that many games using it. 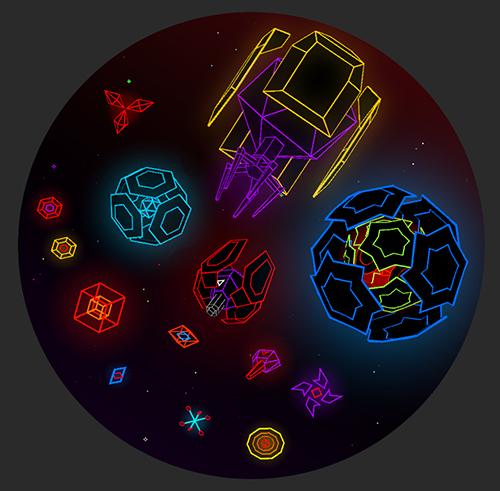 All the old vector games are definitely an inspiration for Super Vektoroids. It was quite a challenging process to figure out how to create the look, but we feel its successful. And how about for the music and sound effects? They certainly fit the game well, but was the thought process behind them? What games or media were influences here? The music in the trailer is a temp track that Sina found at the last minute. It was a perfect fit, but the music in the game will be a blend of more contemporary techno with chiptune elements scattered about. Currently I’m creating the music for the game (plus there are tracks from DarkArps as well), using Spectrasonics Omnisphere, Plogue Chipsounds and Chipspeech, and a Maschine Studio. It’s nice to actually put this equipment to use! The sounds in the game are mostly generated using BXFR, a free sound maker that is quite authentic to the old sounds from the arcades. We really wanted the whole package to feel right, updated to now, but paying homage to the Golden Age of Arcades. Nostalgia is important to us. A few questions about the release process now. Despite being on multiple VR platforms, it’s seemingly not planned for PS VR at the moment. Could that change in future? We definitely want this title on PSVR. But we need to get funding from early access to carry on. So, we are starting on GearVR, for which the game was designed. We would like to get Super Vektoroids on as many systems as possible. Ataribox has certainly piqued our interest. Yes, that is planned. You will just miss out on all the 3D particles and explosions. It’s really a treat for the senses in VR. But it would also be great in 2D, though I can imagine how much fun you would have using touchscreen to play. It’s very much a gamepad game, though we would support on-screen touch controls. Okay, marketing wise you seem to have all the social media boxes checked. But which sites seem to be bringing you the most interest in your game? I suppose we’ll find out when we drop our Early Access trailer. We have a subreddit on Reddit (r/supervektoroids), but it’s pretty quiet there at the moment. It’s hard to manage all this with just two people who have day jobs. I do all the social stuff, and find Twitter to be the most enjoyable. And have you approached the mainstream media or influencers about the game? How has that gone for you? Not really yet. Once we are in Early Access, I’ll be knocking on a lot of doors. We are hoping word of mouth really helps too. Marketing is probably our Achilles heel. Either way, assuming the game does well, do you plan to create any sequels for the title? What would they be like? Oh, most definitely, if Sina’s wrists can take it. He has to be coding like a madman, and it takes its toll. I don’t want to give too much away, but think Multiverse., and a whole lot of friends on the other-side. The war doesn’t end here. Do you have any ideas for other games you want to create after Super Vektoroids is released? Yes, we want to make a title that works with the touch/wands. And is multiplayer. Super Vektoroids is a single player experience, but more players equals more fun. Finally, what advice would you give someone wanting to get into game development? Any words of wisdom here? Damien: Make a game from your heart. Don’t make a game you think will be popular because it’s the current trend in games. You will just end up among countless others who also thought the same thing, plus, the current hot theme will change by the time you are done anyhow. Look into your own self and find the joy you have for games, and base a game off that. Don’t make games for money, make them for the joy inside you that you have toward gaming. You will probably be far more inspired that way, and less likely to give up halfway through. Because there are lots of moments of doubt, frustration, worry. There are a lot of hurdles in game design to jump over. But you can do it. Be original, because you ARE original. Sina: Adding to that, from a development point of view, if you’re just starting out try to make very small projects that you don’t expect to release because you learn so much about how to architect a game from the first attempt that will make your next project more efficient to work on. The most surprising thing for me is the amount of time I spend on ‘non-game’ code such as menus and supporting different VR platforms and controllers. I’m reeeaally looking forward to writing some gameplay code and fun mechanics! And that concludes our interview. But wait, what was that? Yep, it’s a new recommendation for once! Unlike every other developer we’ve interviewed on this site, the folks at PixelStrike games AREN’T merely recommending you start small and work your way up. Instead, they’re recommending something else a lot of prospective game devs need to listen to. Namely, make the game you want to make, not the game you think will make a quick buck. It’s good advice really. Remember, people have seen the endless attempts at copying popular games. They’ve seen all the Minecraft clones and open world survival horror games and asset flips littering the Steam storefront. They’ve seen the Mario copies plastered all over the Google Play Store. But they don’t buy them. They know they’re soulless garbage put forward by a lazy and uninspired developer looking for a bit of quick beer money. People can tell when a project has passion put into it, and these ones don’t. So, heed Pixel Strike Games’ advice there. Make the title you want to make, not the one you feel pressured to create for sales. That way, you’ll make a truly inspired game rather than a lazy knockoff that’ll likely do nowhere near as well as you think it’ll do. Either way, check out PixelStrike games on their various social media accounts, and give your thoughts on our interview here or at the Gaming Latest forums today!